Placecards that come with a glass of bubbly! Simple but effective ceremony programme! Because you all seem to love these posts so much, here’s part 3! (Part 1 is here and part 2 is here). Have a look at some more fantastic ideas from Pinterest. Slow shutter speed photo – very clever! Signature drinks – order a Mr or a Mrs! If money is no object…! No spilling on the dresses while getting ready! Pick your own glass…what a nice idea! There are so many beautiful and clever ideas on Pinterest, I just had to share some more with you! I hope you’re inspired. An RSVP card that just begs for hilarious replies! If your dog is REALLY important to you, then this is a cute pic! 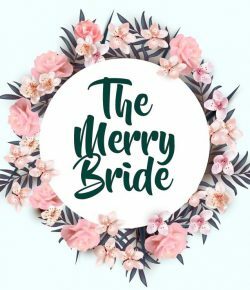 The Merry Bride is on Pinterest (http://pinterest.com/themerrybride) and one of my boards is ‘Cute ideas from elsewhere on Pinterest’. In case you’re not a Pinterest user, I thought I’d share some of them on here, because some of them are truly gorgeous and clever! When the officiant says, “kiss the bride” the maid of honour and best man pull the string and petals fall.